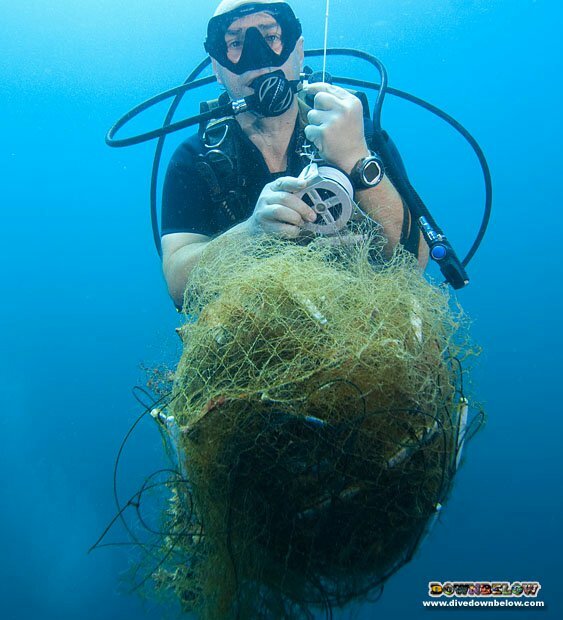 Tunku Abdul Rahman Park, Kota Kinabalu: Downbelow has been on the net removal warpath against nets which have infiltrated the park yet again. The net, that the Downbelow team tackle yesterday, was a tricky one. Stuck on the coral reefs at a depth that required a bit more strategising to remove effectively, the net removal team meticulously planned the assault. Entangled on the reef in >20m of water, the team had to also contend with a bit of current, which meant higher air consumption and limited bottom time. Because of these considerations, the Downbelow team made 2 dives to remove the illegal net stuck on the coral reefs in the TAR Park. 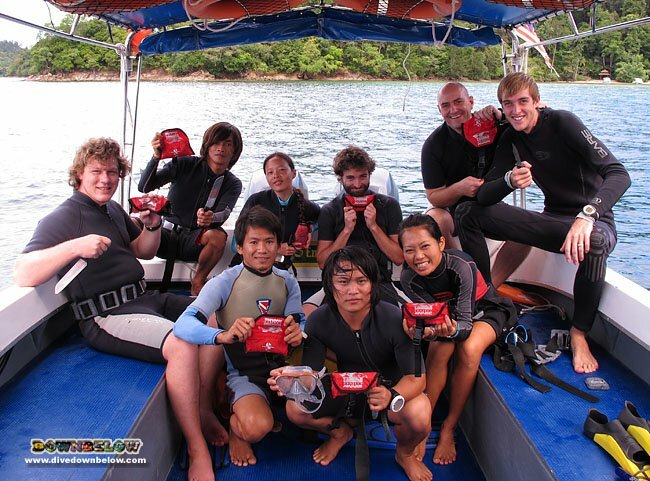 In the team was local divemaster interns and Downbelow staff Gary & Jessica, international divemaster interns Andy, Denise and Jan and current IDC candidates Wellson, Tim Tam and Keiko. The net removal team was lead by Richard and Elvis. During the mission, Richard and Elvis went down first to locate the net and mark the area in which the team would be working. After the net was marked the rest of the team joined them down below. This meant all their available bottom time was spent on cutting free the net from the reef. The team managed to free plenty of live marine life, and successfully removed the net from the coral reef. Well done to the team for their effort, and thanks yet again to Project AWARE for providing their ever useful net bags. There are more pictures on our Facebook page of the team removing this illegal net from the coral reefs in the Tunku Abdul Rahman Park. If you want to get involved with projects like this, email us directly and visit the Project AWARE Foundation website.